It’s a sad distinction, but Montana has once again been ranked as one of the top places in the nation where a collision with a deer is possible. Photo credit: State Farm Mutual Automobile Insurance Company (copyright 2012). Although deer populations have declined in many areas of Montana due to severe winter conditions in 2011 and disease, the state still climbed two spots — from No. 8 to No. 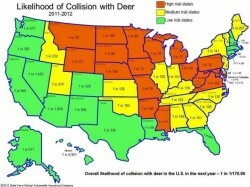 6 — for states where State Farm Insurance believes drivers are most likely to hit a deer. According to the insurance company, drivers have a one in 77 chance of hitting a deer in Montana. That’s considerably higher than in surrounding states. Wyoming drivers have only a one in 113 chance of hitting a deer, Idaho is 1 in 232 and North Dakota is 1 in 105. 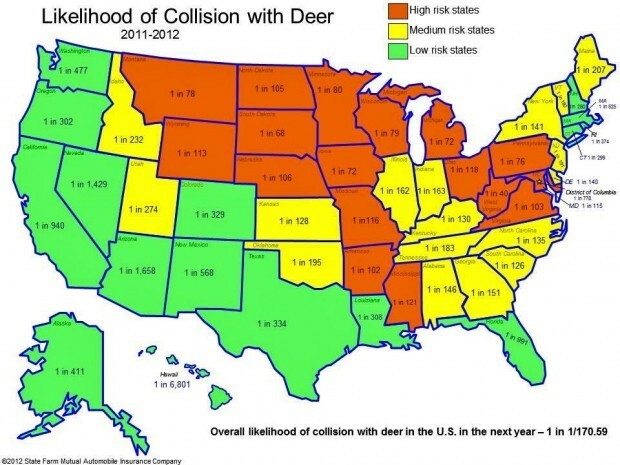 West Virginia leads the nation for the second year in a row with a one in 40 chance of hitting a deer. Hawaii finished last at 1 in 6,801, a state where deer were an introduced species. The national average for the chance of striking a deer is 1 in 171. Although wildlife vs. vehicle collisions aren’t accurately or consistently recorded by states, it’s estimated that about 1 to 2 million such incidents occur in the United States annually, mostly on rural two-lane roads. Studies have also shown the incidence of collisions is increasing. Not only are the collisions harmful to wildlife, but according to a 1995 study they also caused 211 human fatalities, 29,000 human injuries and more than $1 billion in property damage. State Farm puts the number of collisions at 1.5 million annually causing 10,000 human injuries and 150 deaths along with $2,500 in property damage to vehicles. The collisions are also harmful to valued wildlife species, such as the repeated collisions that have occurred on roadways outside of Anaconda and Thompson Falls that have killed more than 100 bighorn sheep. But it is deer that are responsible for most vehicle-wildlife collisions, and right now is a prime time for drivers to see them on Montana’s roadways. That’s because the fall breeding season is in full gear, prompting male deer to wander more in search of females. Morning and evening are the top times for deer movement as they move to feeding and bedding areas. Next to fall, the spring is the next busiest season for wildlife-vehicle collisions. To lessen the chances of collisions, wildlife friendly crossings have been built near Bear Canyon, east of Bozeman, and on Highway 93 south of Arlee. Wyoming recently completed a wildlife crossing for migrating antelope on Highway 191 near Trapper’s Point — one of eight along a 13-mile stretch of the roadway. Wildlife is channeled to the crossings by high fences built along the highways. A wildlife-activated flashing warning sign was also tested on Highway 191 in Yellowstone National Park as a means to alert drivers to wildlife presence along or on roads. These efforts are in addition to the many deer crossing signs erected on numerous highways. Conservation and highway research groups are trying to make such wildlife considerations more common when road construction or reconstruction work is considered. The groups tout the increased safety for drivers as well as the reduced costs to motorists as financial and health reasons behind pursuing the projects. A couple of Montana groups are behind researching the issue, including the Western Transportation Institute at Montana State University and the Craighead Institute in Bozeman. Stay alert. Pay attention to “deer crossing” signs. Scan down the road and off to each side. Be especially watchful in areas near woods and water. If you see one deer, there are probably several others nearby. Be especially vigilant during the peak season. Though collisions can happen any time of year, fall is peak time for deer-car crashes because it’s both hunting and mating seasons, forcing deer to roam outside their normal territory. Use headlights smartly. At night, use high-beams when possible to illuminate the road’s edges. If you see a deer far ahead, flick the brights on and off multiple times: Deer tend to fixate on headlights, so flashing them may cause the animal to scurry away. Watch out at mealtime. Pay particular attention at dusk and dawn, when these animals usually venture out to eat. Brake as necessary. If you think you have time to avoid hitting the animal, reduce speed, tap the brakes to warn drivers behind you, and sound your horn. If there’s no vehicle close behind you, brake hard. Don’t swerve. If a collision seems inevitable, don’t veer off to avoid the animal. Your risk of injury may be greater if you do. Maintain control of the vehicle. Report the accident to the police and your insurance company. Always obey speed limits and wear seat belts.